Spodumene is a silicate mineral often referred to as lithium feldspar. Its mineral form is characterized by hard needle-like grains of brilliant white colour. It is used in ceramics as a source of lithia. Lithia is a very powerful flux, especially when used in conjunction with potash and soda feldspars. As one of only a few natural lithium source materials, spodumene is a valuable component in glass and ceramic/enamel glazes (Li2O reduces thermal expansion, melting temperature and viscosity of the glaze melt). Spodumene is only slightly soluble (in contrast to lithium carbonate). Because spodumene is a natural combination of silica, alumina and lithia it melts better than a chemically equivalent mixture of lithium carbonate, kaolin and silica. Since almost all raw glazes contain kaolin and silica it is normally fairly easy to juggle recipe ingredients in a ceramic chemistry calculation program to introduce spodumene to replace lithium carbonate. Spodumene can also be substituted for part of the feldspar complement in a recipe without disturbing overall chemistry too much (other than substituting Li2O for KNaO). 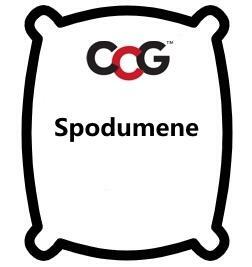 Some types of spodumene do contribute to the formation of bubbles in the glaze slurry. You can wash spodumene before use to alleviate this issue (mix it well in plenty of hot water, allow to settle overnight, pour off the water the next day and dry it). Spodumene is a little more readily fusible than petalite since it is higher in lithium.